It’s beginning to feel a lot like Christmas! 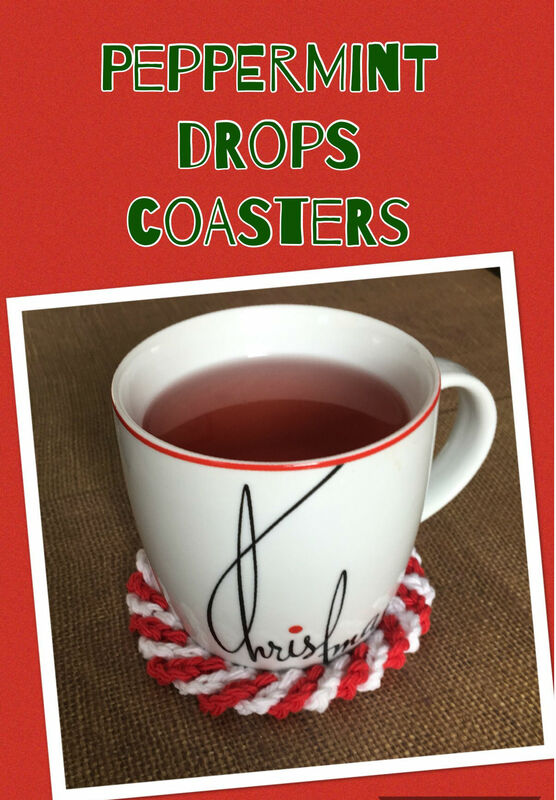 And these peppermint drops coasters will add a festive touch to your home decor. Whipping up these was easy peasy and I made two sets of four. One I’ll be gifting, the other is for me 😉 Just think how cute these will look under a mug of hot chocolate topped with marshmallows. The perfect treat on a snowy evening during this holiday season. The pattern is not my own, all the credit for this goes to Carolyn from The Purple Poncho. You can find the pattern for these coasters here on her blog, just like I did. However, I did make changes to the pattern based on my own personal preferences so I’ll share those with you. 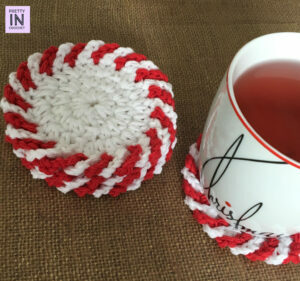 The pattern calls for you to use Red Heart SuperSaver, but I prefer a cotton yarn for my coasters as I think it looks cleaner. By that I mean, less fuzzies. So I chose to use Bernat Handicrafter. Also, I decided to use a 4.00mm hook as opposed to a 6.00mm hook and they came out the perfect size to fit under a mug. So I’m delighted with my coasters! The pattern says it’s appropriate for an intermediate level crocheter, but even if you feel as though you’re not quite there I’d suggest giving these a shot. There is a video to help you out, and if you can crochet in the round these should not be too tricky. I hope you enjoyed visiting the blog today. I hope you’ll drop in to find new patterns and ideas often. Crocheting is such fun! You can stay up to date by signing up for my newsletter or following me on social media. Until next time, happy crocheting.